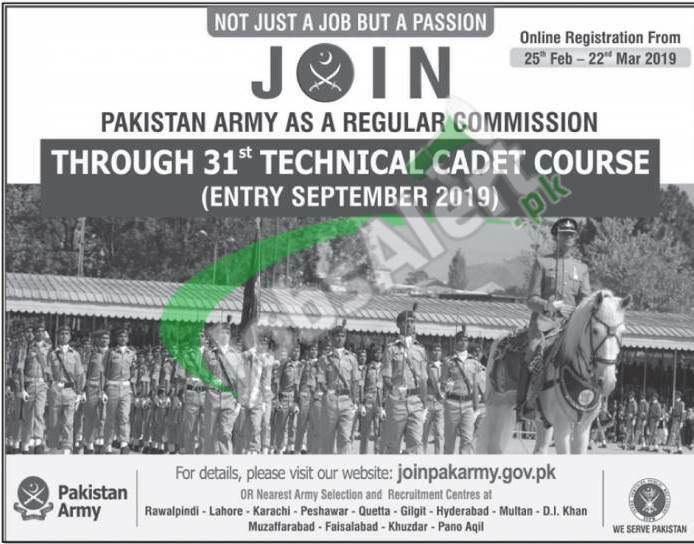 Tap this page for to apply in 31st Technical Cadet Course 2019 Pakistan Army Latest Jobs announced for the Male Individuals across the Pakistan for the following opportunities to be part of Pak Army as Commissioned Officer. Individuals willing to apply should hold FSc. (Pre-Engineering) with Physics, Mathematics, Chemistry / Computer Studies / Computer Sciences with minimum 65% marks or ‘O’ level passed in five subjects and ‘A’ level passed in Mathematics, Physics and Chemistry / Computer Studies / Computer Sciences in Grade A-C to apply. Only eligible individuals meeting criteria are welcome for Pak Army online registration at www.joinpakarmy.gov.pk from February 25th to March 22nd, 2019.